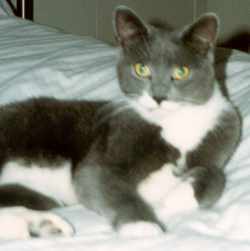 Marcel was adopted by Meredith and Dan in August 1999. He was then about a year old. They write, "Marcel has settled in to his new home well. He is very curious and follows us around like a shadow. He doesn't like being picked up yet, but loves being brushed and having his neck scratched. Marcel bonded right away with his adopted brother, Simba. They love napping together, wrestling and chasing each other back and forth across the house. 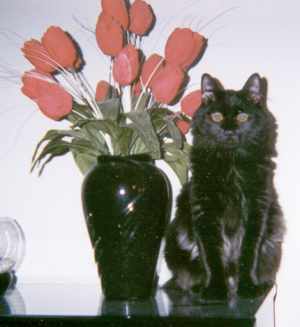 Marcel is a wonderful cat and we all love him!" 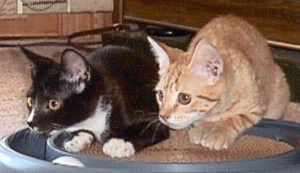 Kenai (left) and Amaya (right) were adopted in July 1999 by Pat, who writes, "I want to thank you for letting us adopt two darling kittens. They are adjusting nicely to our home. The best thing we did was take the two of them, brother and sister. They are always together, eating, playing and sleeping." 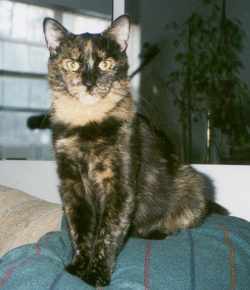 Gwendolyn was adopted in January 1999 by Lisa and Shaun, who write, "Thank you so much for putting us together with our wonderful sweetie Gwendolyn. She was friendly from the 'get go', but it took her a few months to make eye contact with us. Now she gives us frequent blink-kisses. She has an appetite for affection. She gets along well with her adopted sister Lulu, although they were timid around each other at first. Now they share the windowsill to look at birds, wrestle, and chase each other around the apartment." Timber was adopted by Tabitha and Craig. They write, "Timber, formerly known as 'Eclipse', loves his new name! All he does is cuddle and give lots of kisses! I couldn't imagine nobody wanting him. He has made us very happy."